I do love it on the occasions when my children help each other out, even if I have to remind myself of this when they are squabbling over their toys. This app is a great story to share with children about helping others and being considerate of their needs. 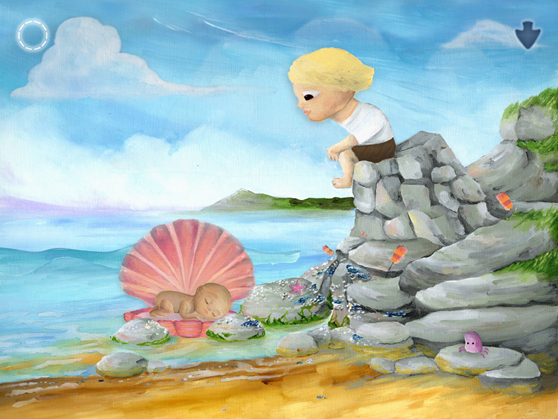 The Gift is the original story of a boy who one day finds a baby girl washed up on the shore, and tries to find out what she needs to make her open her eyes. 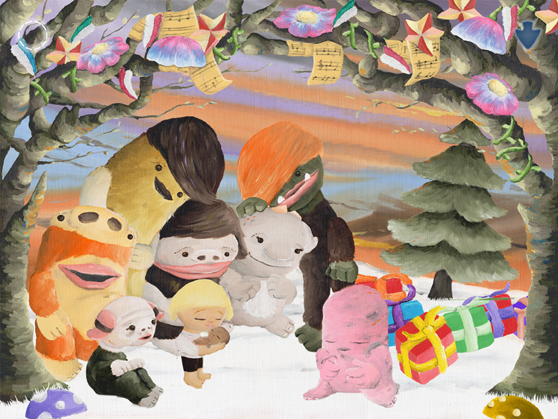 Along the way, he enlists the help of the Oomerels, seven unique characters who live together in a hillside. But in the end, he finds out that he has known what she needs all along. This is a lovely story with very positive messages about taking care of someone, particularly a young child. I can see it being particularly good for any child expecting a new sibling, or having trouble adapting to their arrival. The Oomerels bring gifts which the baby girl might need, beginning with the basics such as food, drink, shelter and warmth, before moving on to music, magic, dreams and finally, helping the boy to bring her love. The writer, Jos Carlyle, says it is a story about the real gift being in the giving, and this does come through. I have to confess that the first time I used this app, I did find it quite difficult to get into, and needed liberal use of the hints to see what interactions were needed to move the story on. I also found the narration a little slow. This was quite frustrating at first. But having read it many times, you come to appreciate the fact that the interactions are completely tied into the story and don’t jar with the text. This is not always the case in story apps so it is a great strength. And the slow pace of the story is, I think, deliberately more relaxed and encourages contemplation. The original illustrations by Dan Mynard are oil paintings and you can see the brush strokes which makes it feel more like a “real” book. The illustrations become richer and richer as items linked to the different needs of the baby build up in layers in the screen until at the end, she is surrounded by reminders of everything the Oomerels and the boy have given her in a lovely celebratory picture. The Oomerels are interesting and engaging characters, from the moment you uncover them, asleep in the hillside, and explore their fur to find hidden objects (one of Mr Tall’s and Little Miss Chatterbox’s favourite sections). The extra Oomerel cards at the end of the app are a nice touch. However an extra game in which you swish the night sky and touch stars to make sounds is not really needed. This is an app to take your time over, to explore rather than rushing through, and is particularly suited to quiet time with your child. It is well worth the initial investment in time to get to know the app and explore the interactions, and will withstand many re-readings, just like a classic picture book. The Gift, developed by Persian Cat Press, compatible with iPhone, iPod touch and iPad. Available from http://itunes.apple.com/gb/app/gift-interactive-storybook/id505214502?mt=8 priced at £0.69/$0.99 at time of writing – but the price is to rise during week starting 25 June 2012. Disclaimer: I won a free copy of this app in January 2012 in a competition run by PCP on Twitter. This has not affected my review, which is entirely my own opinion, and had I not won the competition I had already intended to purchase a copy.